For some reason, Caroline Overington, in her attacks on Yassmin Abdel-Magied in The Australian, cannot seem to understand this whole idea of soft diplomacy. In 2008, I went to an event at Gleebooks, an independent bookshop in Sydney’s inner west. The British Council and High Commission was putting on a do for a visiting author of conservative bent. The book was, in parts, entertaining but also included some rather sexist material. (Toward the end of the book, the author wrote about a female friend of his and made specific mention of the size of her posterior growing larger since the last time he saw her.) Still, that didn’t stop the British taxpayer from forking out some dosh, just as they would do for any author or performer or artist whose work suits their soft diplomacy interests. In the case of the present author, perhaps the book suited some “deradicalisation of young Muslims” purpose. DFAT and Australian embassies do the same. As with all activities of DFAT, it all comes out of our pocket. Soft diplomacy, soft power, person-to-person contact, whatever you wish to call it. Australian artists and writers visit various places to collaborate with other articles via a host of programs run by universities as well as DFAT sections such as the Australia Indonesia Institute. Now I am no sycophant of Indonesia, especially when it comes to the treatment of Christian politicians like Ahok. But I learned a hell of a lot about the religious cultures and civil society organisations of our closest Muslim-majority neighbour when I visited Indonesia on a DFAT-funded junket in January 2006. As did the five other Australians who joined me. So why am I saying all this? Because, for some reason, Caroline Overington of The Australian cannot seem to understand this whole idea of soft diplomacy. 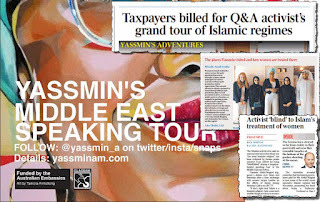 After a robust shouting match on Q&A over sharia between engineer Yassmin Abdel-Magied and independent Senator Jacqui Lambie on Monday evening, Overington decided on Thursday to run a front-page “scoop” headlined “Taxpayers billed for Q&A activist’s grand tour of Islamic regimes“. A terrific culture-war story for The Australian‘s diminishing readership. It has all the ingredients: the wretched Q&A, the nasty ABC, the satanic Tony Jones and the nasty religion whose adherents make up a frightening 25% of humanity. But seriously, reading the story made me wonder what all the fuss was about. It was hardly a scoop. Overington herself notes that the not-so-grant tour was promoted “last November”. That’s three months ago. Overington is especially upset about the fact that Abdel-Magied visited these nasty brutal regimes while claiming on Q&A that she saw Islam as “the most feminist religion”. Now, I’m no women’s activist, but I felt a bit perturbed about Abdel-Magied’s claim. True, in an ideal Islamic world, things might work out well for the Muslim ladies. But in reality, most Middle Eastern women aren’t enjoying the freedoms that Yassmin Abdel-Magied, Jacqui Lambie and Caroline Overington do here. But it was almost as if Overington were arguing that someone with Abdel-Magied’s beliefs should not be sent by DFAT. What kind of woman should they send, then? Kirralie whatserface from the Q Society? Janet Albrechtsen? Andrew Bolt? Overington discusses at length the awful treatment of women in the countries Abdel-Magied visited. This is all public knowledge, and Overington may ask herself why Abdel-Magied, her family, my mum, my siblings, me, my nephew and my nephew’s dog refuse to live in any of these places. Still, the fact remains that we have to have relations with these nations. Overington’s employer was once partly owned by a Saudi prince. A fair few Australians do business with these places. Our food exports help shore up food security in the region, despite our insistence on fighting unpopular wars there, and pursuing a foreign policy that is despised across the region. Yassmin Abdel-Magied­ visited a number of countries in the Middle East to promote Australia as an open, innovative, democratic and diverse nation. She met youth representatives, scientists, entrepreneurs, women’s groups and others. Soft diplomacy is money well spent. Perhaps Overington could learn some herself. First published in Crikey on 17 February 2017. The guy was the wiliest of wily politicians who co-authored the constitution that created the revolutionary government. It was 1979. I was in year 4 at Ryde East Primary School. Something terrible happened. It was called a “revolution” and was all over the TV news, which, back in those days, I only watched because I was forced to. It took place in Iran, a country next door to my dad’s country and one whose name I always remembered because it sounded so much like my own. Before this, Iran had been a really good place where everyone liked America, drank alcohol and dressed all modern and stuff. They had a nice handsome-looking king, but they overthrew him in favour of a bearded man named Ruhollah Khomeini with big nasty beady eyes whose colleagues also sported beards and wore black coats with black turbans. These guys rarely smiled, and their young followers used to scream death to America and death to Israel. I wouldn’t have known it at the time, but one of the nasty black-cloaked dudes standing with Khomeini and whispering advice into his ear was a pistachio farmer named Ali Akbar Hashemi Rafsanjani. He died on Sunday, and his legacy will remain for decades o come. Five years later, as my interest in political Islam grew, there weren’t too many religious books available in English. We didn’t have the internet, and media sources were also limited. Yet whether you watched Eyewitness News on Channel Ten or read the three-in-one rice paper weekly consisting of The Guardian, Le Monde and The Washington Post, the news on Iran was never nice. Our local mosques and imams also didn’t have nice things to say about Iran, despite being all cheery about the Afghan jihadists battling the nasty communists. And the only Iranian voices we ever heard were from those who were fleeing the Shah and the Islamic regime. But any kid interested in political Islam had to learn about the Iranian Revolution. 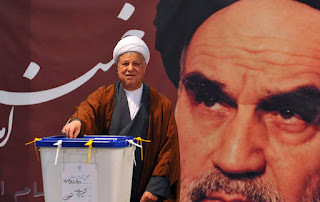 For these early years, the voice of relative sanity among the Iranian regime was Rafsanjani. Whether American diplomats were being taken hostage by Iranian students or American journalists kidnapped for seven years by pro-Iranian militias in Beirut or the same militias engaging in suicide attacks against Israeli troops, Rafsanjani was always being presented as the good guy. Yet the reality was that such violent excesses were unlikely to have happened without Rafsanjani’s acquiescence or at least knowledge. The guy was the wiliest of wily politicians and co-authored the constitution that created the revolutionary government before holding just about every major leadership position. Among the positions he held was commander in chief of the armed forces during the 1980-88 war with Iraq. Perhaps the best (and funniest) account of the effects of the war on Iranians living near the Iraqi border can be found in Good Muslim Boy, the memoir of Iranian-Iraqi-Australian actor and author Osamah Sami. Rafsanjani wasn’t terribly liked by ethnic and religious minorities, including those of the same faith. He also is believed to have played a role in having Iranian dissidents in Europe assassinated, and also was involved in an attack on a Jewish community centre in Buenos Aires. At the same time, while speaker of the Iranian parliament, Rafsanjani oversaw a system in which Jews, Christians and Zoroastrians had seats reserved for them. After the war, Rafsanjani was elected president. He held that position twice before losing to Mahmoud Ahmadinejad, Iran’s very own version of Donald Trump, in 2005. Hopefully for the world, we won’t be seeing an Iranian Trump win the 2017 Iranian presidential elections. Rafsanjani went onto hold other influential positions. He also founded a university and wrote a 20-volume commentary of the Koran. How will he be remembered? Iraqis, including devout Iraqi Shia, will recall him as the man who led a war effort against their country even as they resented Saddam Hussein. Lebanese and Israelis will remember Rafsanjani as the man who gave them Hezbollah. Militias claiming to represent Syria’s Sunni majority will remember Rafsanjani as wavering over Iran’s support for the Syrian regime. And young Iranians? For them, Rafsanjani was a key leader of Iran’s self-styled Islamic Revolution. This remains at heart an ideological revolution even if most people it rules over have never seen the ideological and political struggles of the revolution’s founders. They have never seen the repression of the Shah, but experience on a daily basis arguably lesser repression of the theocrats. These young people never saw Rafsanjani imprisoned and tortured by Iran’s US-backed Shah and his vicious Israeli-trained SAVAK secret police. They are young people who don’t resent Western culture in the manner of Rafsanjani’s generation. And they are unlikely to share in the millions, which Rafsanjani and his family amassed during his time holding various positions in the revolutionary regime. First published in Crikey on 12 January 2017.